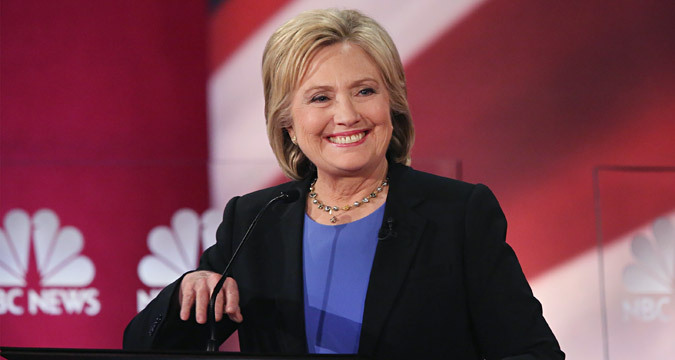 Democratic presidential candidate Hillary Clinton participates in the Democratic Candidates Debate on Jan. 17, 2016 in Charleston. Final Democratic presidential debate before party selects candidate. The debate was held in Charleston, South Carolina. Among other topics, the issue of U.S. relations with Russia was raised. Clinton was asked if she would give another “reset” button to Vladimir Putin. For his part, candidate Bernie Sanders, Clinton’s main challenger, said, “Unfortunately much of that budget (referring to military spending) continues to fight the old Cold War with the Soviet Union. Very little of that budget – less than 10 percent – actually goes into fighting ISIS and international terrorism. We need to be thinking hard about making fundamental changes in the priorities of the Defense Department.” Sanders went on to imply that the U.S.’s main goal should be fighting ISIS with Russia, Iran and other Muslim-majority countries, while removing Syrian President Bashar al-Assad would be next in line as a priority.